In connection with the exhibition “Dave Allen – Cannon to the Hammer of the Gods”, Ö1 Kunstradio presents the radio art piece „Games for May“, a re-recording of the soundtrack from Pink Floyd’s legendary film „Live at Pompeii“ played in the Galerie space at the Secession. This additional information causes a conceptual shift resp. expansion, in terms of time as well as of the geographical location, and is consequently pursued when aired on Kunstradio in June. The title refers to an early Pink Floyd song, to the time of the recording as well as to the original function of the Pompeii amphitheatre. Your exhibition CANON TO THE HAMMER OF THE GODS at the Secession in Vienna is open until 22 June 2008. What's the background of the Canon? When I'm invited to do an exhibition, such as the one at the Secession, I take a look at the institution itself and the place, the city and its history. I try to find out as much as I can, anything that triggers some idea. In this case, I had several thoughts. I had been working with a piece of music by Cozy Powell which then eventually became a part of the canon. I had been thinking about that for some time. Cozy Powell was a hero of my youth, I adored him when I was a kid. He has an interesting history, he's the only famous drummer with a solo career in Britain. This is one element of it. Then I read more and more about the Secession, and I found a story about when the foundation stone was laid. Klimt and the other founding members had a funny ritual, where they struck the stone with a hammer, three times. And then it clicked for me: I remembered that in the Cozy Powell song, the main refrain of the song has this very strong three-beat rhythm to it. 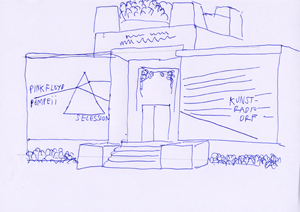 Originally I was thinking about the piece using all three rooms at the Secession. It would have been super miminal but I thought some more about the space and it wasn't going to work for me. 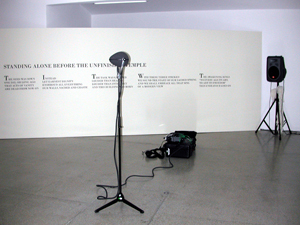 So, I wrote the canon in three parts and the sound installation was set up in one room. Where do the lyrics come from? I wanted to write lyrics that related to the history of the Secession. Those early days are often described as the Golden, Heroic Days of the Secession. I found a piece of writing by Joseph Maria Olbrich, the architect who planned the Secession, describing his initial ideas for the building - his writing was so flowery and poetic that it really sat well with the idea. It may not so suitable for a rock song, but then again maybe so. I worked with the text, paraphrasing some of his sentences. The first part of the canon deals with his writing and the second part is more about the continuing future of the Secession. You work a lot with references, with interconnected myths, stories or facts that on first sight have nothing in common. It can be difficult with all these references, because now you can research them so simply, via the internet. I was thinking of this the other day: I do work quite referentially, I suppose. Sometimes you can end up chasing after your tail, if you try to get an idea together and you are trying to make references fit together. Sometimes I find it a bit difficult. And then I switch the computer off. So you believe that a work of art shouldn't be pinned down to a list of references. No, of course, there is always more to it. For this show I researched Klimt a lot, he became this character for me that I didn't know too much about previously, but I really got into his work. And that made me think about our perception of his work. When Klimt worked, at the beginning of the last century, what the work meant at that time is viewed completely different today. We get his work packaged for us. We know it. Tonight I saw an image of “The Kiss”, when I was coming in from the airport. It was an ad for Belvedere, with the slogan “Just a kiss away”, historians in museums have packaged the work for us. You know, we can never go to this work afresh. Art needn't just be boiled down to be an iconic image, or a mouse pad, or T-shirts. Well, maybe a T-shirt is okay. But I have never seen a cool art mouse pad before. For Kunstradio you are producing a new radio work: basically, you are playing back an existing piece of music, “Pink Floyd live at Pompeii” and recording it in the Secession's Galerie downstairs. I'd had this idea before of replaying a live album in another location. Firstly, I guess, to just alter the sound a little. If you played it here, in this hotel room, it would sound different than listening to it somewhere else, obviously. Usually, when I work with music, I don't rework it, I just change some physical element of it. It's like a remix but without computer manipulation - I usually alter a physical parameter to make it sound differently. So, I thought it might be interesting to play a live recording within the ambience of another space. And then the radio listeners get to hear another ambience according to where they listen, on top of it. And why did you choose Pink Floyds' live concert in the Pompeii Amphitheatre? I can't remember exactly when I thought of Pink Floyd. I tried to think of iconic live albums and then I came across “Pink Floyd live at Pompeii”. Interestingly enough, it's not an album, it's a film. Initially I thought Pink Floyd had been behind the film, because it does sound like something they would do. But it was actually a film director that went to them with the film idea. Pink Floyd liked it and so they went off to Pompeii for a few days in 1971. Recently I saw an interview with the filmmaker and he said he had this idea, he wanted to make a film with Pink Floyd, but he didn't know where. And suddenly it clicked with him, when he was on holiday in Pompeii. It fitted. That's kind of nice, so I had this thought about Pink Floyd, and that it could work, Pompeii could work. And then I saw the film and I got really into it. I was not a Pink Floyd fan before, but now I am, to a certain extent. There is a nice relationship between the Amphitheatre and Kreuzraum at the Secession. The band are playing a live set but without audience, so there is just the band and a camera. In Kreuzraum we are going to be playing it back and recording it, again with a supposed audience. So, like you would think cinema goers are the film's audience, we think of the radio listeners to be our audience. So, these are nice little things which ultimately tie in. It is interesting to talk about it in this sense. I always have in the back of my mind this piece by Alvin Lucier, “I am sitting in a room” from 1970, which is the most fantastic piece of work. Lucier is in a room with a tape recorder, and he has this piece of text, which begins “I am sitting in a room, not like the room you are in...” He describes the process or the act he is performing. The text describes him, sitting in a room, and then he would record it, his speech. And then he would record the recording of the speech. And then again - I don't know how many times he does it. By playing it back and recording his recording, the sound is changed by the architecture of the room. Some frequencies are exaggerated and some lost. So, in the end it becomes like a rhythmic, or arhythmic sound - it really is an amazing piece. I like how a simple act of recording and re-recording can change a piece. I was thinking how to change a piece of music or twist a piece of music, or make it into something which brings another idea to someone. You don't need to hear it, just to know about it. And these ideas stay with you. You did a series of ambience recordings in studios and concert halls. The first time I done it I was in Glasgow, but I really got into it when I was in Berlin. Initially I recorded the ambience of the Berliner Philharmonie. It was really exciting to be in there with the sound engineer and to record an empty concert hall. Then I made a recording at the Hansa Studios at the Wall. That worked in a different way, because with this I was thinking of recording a sound that so many people have actually heard before. I was using these rooms, where Bowie had recorded his “Heroes” and “Low” albums. Iggy Pop had recorded there, and Nick Cave, too. So there is this bunch of cool people, and then there is a bunch of funny Schlager people. Depending on what you are into, it means something different. So, if we think of Nick Cave or Tony Christie on the radio, many many times people would have heard the sound of the studios somewhere there in the back, although the engineer tries to get rid of that. What I do is, to play back to you a sound which you know - you have already heard via radio or your stereo, theoretically. When I play it in galleries, I amplify the sound a little, so that when you first go into the room you can hear a slight hiss, but you very quickly get used to it and it soon becomes assimilated by all the other sounds and it disappears. That's how it works. 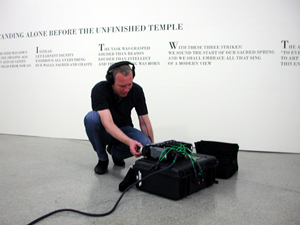 Do you experience difficulties with the audience of sound installations? I always have a problem with these works which are speakers or speaker oriented. When I present the silence piece I just have a Hi-Fi and speakers. Lots of people don't get it, when they come in and they don't hear something or see something, they think it is broken and they just leave. I have done a lot of things like this, where there is nothing happening but you can hear it. And people think it is broken. Maybe this is why this piece for Kunstradio is so bombastic and over the top. With works like the “Mirrored Catalogue d'Oiseaux” you indicate possibilities - in this case of mockingbirds picking up melodies from Messiaen's composition “Catalogue d'Oiseaux”. Does it then matter if the experiment works or fails? In the case of the "Mirrored Catalogue..." it is more about the poetic possibility of them doing that. That's also what the continuation of the project at the Secession is about. By playing back the recording, the mimicking birds of Vienna can keep pick up Messiaen's melodies. There are starlings here, maybe they will pick them up. But it is not so much about the actuality of it happening. And then you also did a piece where you played it on the radio and you asked people to put the speakers in the windows. I have been invited to do a couple of radio broadcasts and I like the idea of playing birdsong on the radio for 40 minutes. And that the listener could possibly listen a bit less passively or less passive than they usually do, that you could work with “audience participation”, I guess, to make them be part of something if they wanted. What role does the radio play today? Often, people's radios just sit in their kitchens, gathering dust, you switch it on and off - but radio has so much more to offer, I find it very exciting. Now, especially with internet radio, you can tune into thousands of stations. It totally blows my mind sometimes. Like, which one do you choose? You are a musician yourself, you play the guitar. Where does your interest in music, and in its structures such as notation, learning and teaching etc., come from? When I was learning guitar as a kid I wasn't aware of any formal method to play the guitar. I think I had one book of Beatles songs, but I didn't know how to tune my guitar. When someone showed me how to play barchords I thought that it was such a revelation, like, why didn't someone show me that five years before? I don't come from an academic music background, so I guess I am trying to find my way through. One thing I always wondered: if it was possible to have the same approach to writing about art as theere exists with writing about music. Is it possible to have a "Rolling Stone" of art? Could there be a magazine like "Rolling Stone" concerned with art rather than music? Art with a view to current events in the world. What would it be like? Maybe art doesn't have the element of immediacy of Rock'n'Roll. Like, you can't get art in a three-minute pop song. Or you can't get really sustainable art in a three-minute-pop-song. Although, three-minute pop songs, thinking on it - there are a few that are really powerful.